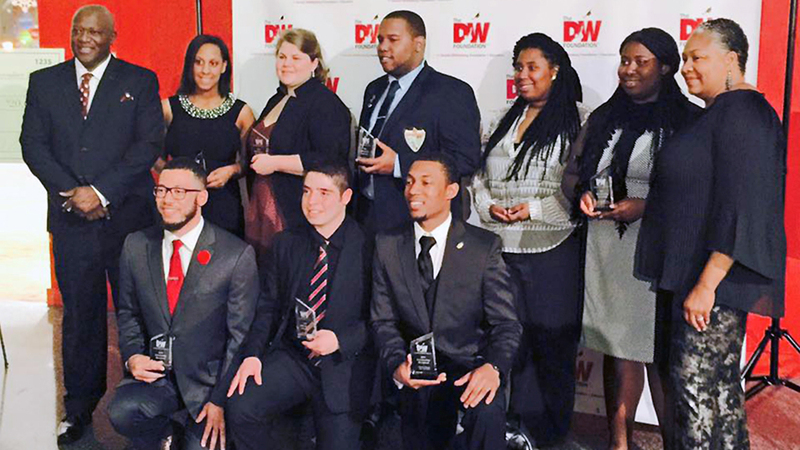 NC State students (left to right) Jorge Ramos Ruiz, Brian Tilley, Melissa Richardson and Sarah Snow recently received scholarships from the Dereck Whittenburg Foundation. Image courtesy of the foundation. As a player and assistant coach, Dereck Whittenburg has been part of many memorable moments for the NC State men’s basketball team. Whittenburg, a starting guard on the Jim Valvano-coached team that made the incredible run to the 1983 national title, is one of the university’s best-known and most-beloved former athletes, after all. 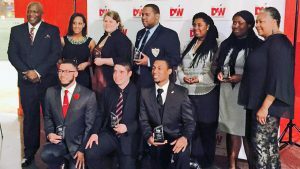 But during the first week of December, Whittenburg — who has served as NC State’s associate athletics director for community relations and student support since October — and his wife, Jacqueline, played the key roles in what they called a different kind of memorable and magical Wolfpack evening. Earlier this year, the couple started the Dereck Whittenburg Foundation for Education, in order to provide need-based scholarship support for students at NC State and Shaw University. Four students from each institution became the inaugural recipients of onetime scholarships from the foundation during a ceremony held Dec. 2 at Marbles Museum in downtown Raleigh. During the evening at Marbles, each scholarship recipient spoke briefly about their academic studies, community service and plans after graduation, as well as about what the financial support means to them. Dereck Whittenburg said that he and his wife have an increasingly strong commitment to supporting students. “Working in higher education for the course of my career, I have seen the continued struggles of students that reach walls of hardship. Collectively, we decided to partner in their efforts and provide needed assistance,” he said. Awarding these scholarships was a proud moment for us and a tribute to the seeds planted in us by our loving parents. They taught us stewardship and responsibility for our community, and we understood the call to provide a lift of assistance. Prior to beginning his current position, Dereck Whittenburg had served since fall 2013 on Coach Mark Gottfried’s staff, as senior assistant to the NC State head men’s basketball coach and director of player development. Dereck and Jacqueline Whittenburg (far left and right, respectively) pose with NC State and Shaw scholarship winners. He has nearly 30 years of experience as a college basketball head and assistant coach, and has served as a college basketball analyst for ESPN, a regional scout for the Utah Jazz of the NBA and a longtime member of the board of directors for the V Foundation for Cancer Research. A native of Washington, D.C., he earned a B.S. in business administration from NC State in 1984. Jacqueline Whittenburg has personal ties to NC State, too. She grew up in Wake County and began her college career at Saint Augustine’s University and NC State, before completing her B.S. in developmental biology and chemistry at Wagner College. A certified clinical research monitoring associate, she also attended Laval University in Quebec, Canada, on an academic scholarship to earn a certificate in conversational French and has earned certification in oral radiology from the University of Colorado’s School of Dentistry. In addition to serving as executive director of the Dereck Whittenburg Foundation for Education, Jacqueline Whittenburg serves on the board of Raleigh-based nonprofit StepUp Ministry. To learn more about the Dereck Whittenburg Foundation for Education and its efforts to support students, visit www.thedwfoundation.org.